Before delving into the intricacies of the museum established by Her Highness Sayyida Ghalya bint Fahr bin Taimour Al Said, I would like, at the outset, to briefly explain what is a personal museum. A personal museum is very simply put, the exhibition of a collection of objects obtained through inheritance or purchase. This collection can be exhibited in a place that could be a room in the owner's house, a gallery leased for a certain time, or an old house that is part of the family's inheritance. If the owner has the means, he or she could then build an independent museum. Indeed, the trend to acquire objects is practiced by many. It is more like an instinct. Yet the difference between one trend and another is the goal behind it. If the goal here is to establish a personal museum, then it is the objective and is more likely preceded by some level of awareness, whether natural or acquired. The trend to establishing this type of personal museums indicates a cultural and intellectual attitude governed by their owner's awareness that whatever they have is important and can be beneficial to them and others. The collection need not necessarily be old, but should be unique. However, despite the goodwill behind establishing these museums, there are always problems, and they can be many. Therefore, the intervention of concerned governmental institutions to provide the owners of these museums with material and moral support is of extreme importance. Ghalya's Museum of Modern Art, on the sea front of Muttrah, comes with a new vision combining three aspects that look to the future through examining the past. Firstly, the old Omani house in this museum doesn't merely exhibit the objects used by Omanis between 1950 and 1975, but also focuses on the relationship between the Omani and the specifics of that time and place, together with all the developments in this relationship. In other words, it highlights the Omani's struggle to acquire knowledge, learn arts and keep abreast with ongoing developments. Secondly, the Clothes Museum promotes traditional Omani costumes and adds a modern touch to them. 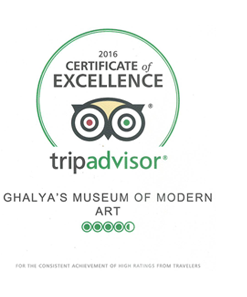 Thirdly, the Modern gallery exhibits the creativity of the Omani artist and aims to publicise it on a global scale. The Museum addresses a philosophical and aesthetic issue, which is the relationship between the Omani and his past, present and future. In other words, it looks at where he was, where he is, and where he will be.